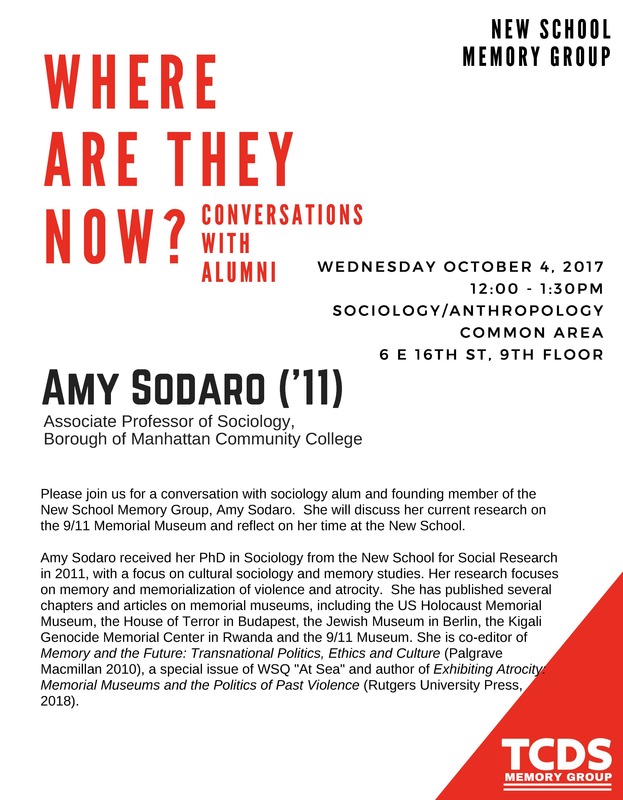 Former TCDS Coordinator Amy Sodaro, who did her PhD in Sociology at NSSR, will give an alumni lecture as part of the “Where Are They Now?” series this Wednesday, October 4th, 2017 in the Sociology Department Common Area, 6 E 16th St., 9th floor, at 12 pm. Professor Sodaro is a founding member of the New School Memory Group and will discuss her current research on the 9/11 Memorial Museum and reflect on her time at the New School. Amy Sodaro received her PhD in Sociology from the New School for Social Research in 2011, with a focus on cultural sociology and memory studies. Her research focuses on memory and memorialization of violence and atrocity. She has published several chapters and articles on memorial museums, including the US Holocaust Memorial Museum, the House of Terror in Budapest, the Jewish Museum in Berlin, the Kigali Genocide Memorial Center in Rwanda and the 9/11 Museum. She is co-editor of Memory and the Future: Transnational Politics, Ethics and Culture (Palgrave Macmillan 2010), a special issue of WSQ “At Sea” and author of Exhibiting Atrocity: Memorial Museums and the Politics of Past Violence (Rutgers University Press, 2018). ← TCDS Memory Group Information Meeting, Wednesday 9/27!